ELIZABETH II Typed Letter Signed (TLS). Queen of the United Kingdom and constitutional monarch of 16 Sovereign States. TLS. 1p. Buckingham Palace. 11th December, 1947. 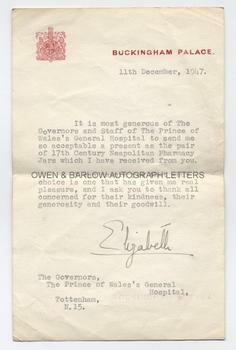 To The Governors of the Prince of Wales's General Hospital. A letter of thanks for their wedding gift, with autograph SIGNATURE. "It is most gereous of the Governors and Staff of the Prince of Wales's General Hospital to send me so acceptable a present as the pair of 17th Century Neopolitan Pharmacy Jars which I have received from you. I can assure you that your choice is one that has given me real pleasure, and I ask you to thank all concerned for their kindness, their generosity and their goodwill." With good autograph SIGNATURE. 8vo. Approx 7.5 x 4.75 inches. Very slight creases, else fine. The then Princess Elizabeth had married Prince Philip of Greece on 20th November, 1947. In 1952, whilst the couple were in Kenya en route to Australia, she received news of the death of her father, George VI and she was proclaimed Queen Elizabeth II. She is the longest lived and the second longest reigning monarch in British history.